Food Can Make You Feel Better! Food can be a source of inflammation causing symptoms like headache, bloating, brain fog, joint pain, heart burn, weight gain & even diseases like diabetes, lupus, arthritis, & other autoimmune diseases. 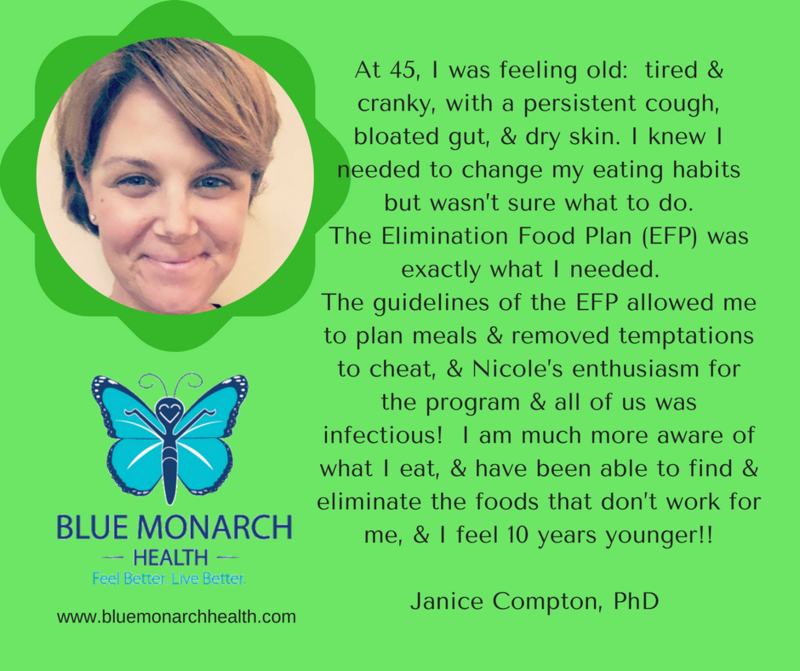 Food is often overlooked, BUT, research shows that an Elimination Food Plan is the gold standard to address symptoms & illness without adding medicines or invasive testing or making you buy supplements or additional foods. In our group, we remove commonly sensitive foods for 21 days, then bring them back one by one to see how our bodies, mind & spirit respond. It's an experiment to find your best health! PLUS... we ADD many more foods to help you feel stronger, healthier, have more energy & FEEL BETTER! Then we return foods one by one to determine which foods are triggers for the symptoms you're having. Plus, you get access to a board certified Nurse Coach and your group for 8 weeks of the program! Being Part of a Group Is Fun! We do this program TOGETHER! Everyone goes through the education sessions and begins the Elimination & Reintroduction phases on the same date, following through with each other until the end (it takes about 8 weeks to complete this plan). SO FUN! Understanding how food affects YOU will help you discover your BEST health and wholeness.